Bereaved families and union members have joined together to hold a rally marking Workers' Memorial Day. The event is held to remember those killed in the workplace and to promote workplace health and safety. 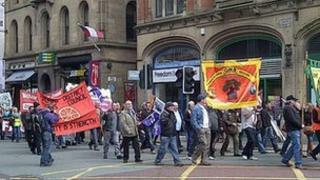 Workers and family members marched from the CIS Building at 12:30 BST to a rally in Albert Square at 13:00 BST. Health and Safety Executive (HSE) records show there were 45 workers killed in workplace incidents in the North West in the past two years. "On Workers' Memorial Day we remember the dead but we also fight for the living," said Linzi Herbertson, whose husband was killed at work in Oldham in 1998, prompting her to set up Families Against Corporate Killers (Fack). "We want people to realise that health and safety isn't a joke, it's about whether someone comes home after work, alive and well, or not." Of the 45 workers the HSE records show died in incidents in the North West, 15 were killed by vehicles, 10 by machinery and nine were killed in falls. Five were killed by objects falling on them and others were killed by cattle, crushed in a trench, drowned, killed in a fire and poisoned by carbon monoxide. The event was jointly organised by North West Trade Unions, Greater Manchester Hazards Centre and Fack.